Where the airline and hotel industries have pioneered, the golf industry is slowly going. Dynamic pricing is one of the new keys to successfully growing revenue at the golf course. Obviously most golf operators already know this. Typically we see differences in price between weekend and weekday tee times or morning and evening tee times. We call this static pricing and unfortunately it doesn't go far enough. Dynamic pricing is built on the idea that the value of every tee time expires and its value fluctuates up until its expiration date. The strategy is to adjust pricing according to the market's willingness to pay for a round depending on when the booking is made. While dynamic pricing may come off as expensive and overly sophisticated, modern cloud based systems and data analysis have made it better and much more affordable. Business intelligence in many industries is far superior to what is was years ago, it helped the Airline and Hotel industries stay afloat in the face of rising costs and wages. Similarly, today's golf operator must consider moving past the static pricing strategies of yesterday. In an industry that is struggling to increase round bookings, there's too much at stake to not squeeze every possible dollar out of each tee time. The market will dictate when your tee sheet will fill out, but when one part of the day fills up well in advance, that says something about the value of tee times around that part of the day. Golf course dynamic pricing software tools make it possible automate pricing changes when a hot day-part fills up. For example, if your 9:00 am to 10:00 am slot fills up 7 days-out, the software can automatically go into the prices and raise them by however much. This helps capture the value of tee times around hot parts of the day. Dynamic pricing makes it possible to capture maximum value from the most desirable time periods on your tee sheet. Plus you'll drive players to book further in advance, meaning you can plan management activities with more foresight as to what time periods will be busy. With modern software you gain more control than ever before. Golf course dynamic pricing software combines data and business intelligence for deriving the best formula over time. Business intelligence software is a strong foundation for building a dynamic pricing strategy. However, these programs only adjust prices based on one variable and are reactive to their environment. What if it were possible to proactively predict a spike in demand and adjust prices accordingly before the tee sheet fills up? That's where the human touch comes in. Research tells us that more than 25 variables can affect the value of a tee time. Weather, historical patterns, events in the area, and even tournaments at competing golf courses can cause changes in demand. It takes analysis done by managed services to truly capture these shifts in value. Of course, golf operators need to collect good data before being able to understand what prices need to be adjusted. Cloud software with best-of-breed integrations can dramatically improve data collection since every part of the system from CRM to POS to marketing to distribution is seamlessly integrated. Couple robust segmentation tools with sales and inventory data stored in the POS to understand when specific demographics play and how much cash they spend per outing. Managed services will take a look at your utilization metrics to get a handle on when the season is high and low or what times are statistically most and least popular. 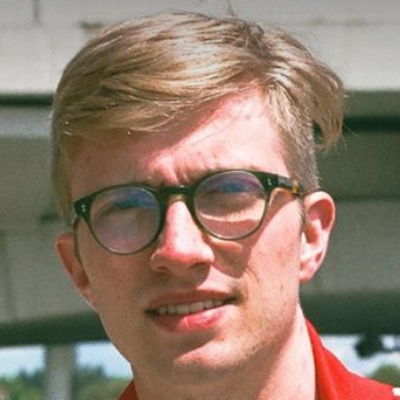 Hiring professional consultants to do a serious audit of your data will clarify what times of the day are valuable and what times should be discounted. We've heard stories from golf operators who turned to dynamic pricing consultants to analyze their data and discovered that they could increase revenue at their golf course when a major sporting event came to town or a seasonal tourist attraction was drawing more potential round bookings into the area. Of course there are some drawbacks of using a dynamic pricing model. Some operators worry that this kind of software will devalue tee times in the long run and clog up the tee sheet. Others aren't sure what to say when someone phones in asking what the price of a round is or whether golfers are going to get angry when they learn they've paid more for a tee time than their partner. 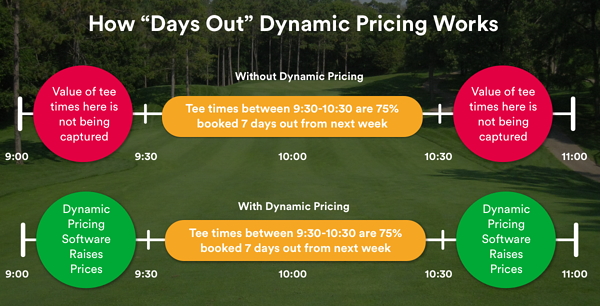 The reality is that dynamic pricing not just about lowering the price of tee times. In a lot of cases, golf operators learn when they can charge far above what they ever thought was possible just by analyzing the data and tracking utilization. When asked what the price of a round is, staff members at golf courses that use dynamic pricing reply by offering a range of prices. The customer's answer is then be used by the golf course to determine the optimal play time. Some golf courses take this a step further by allowing players to actually bid on the top 5 weekend start times! This allows golf courses to be transparent about how much each player is paying and dramatically reduces the risk of causing unhappiness over pricing discrepancies, all while increasing revenues. Perhaps the biggest hurdle when it comes to dynamic pricing is the sheer amount of time it takes to maintain and optimize. Golf course managers are constantly strapped for time and often it doesn't make sense to spend hours pouring over a tee sheet to make all the small adjustments necessary. That's where dynamic pricing software and services come in. Chronogolf, for example, has developed affordable dynamic pricing software that is able to actually analyze day-parts on the tee sheet and make pricing adjustments based on utilization and number of days-out. This kind of automation dramatically reduces the amount of time it takes to optimize pricing on a tee sheet. To bolster dynamic pricing efforts, golf operators can contract companies like GolfNow or Dynamic Revenue Services for help in analyzing the 25+ variables that affect tee time value. The cost of this kind of consultation is absolutely worth it because these companies generate proven R.O.I. and have helped hundreds of golf operators optimize pricing around the world. GolfNow created its managed dynamic pricing service ‘Plus' after realizing thousands of golf course teams were struggling to find the time to go deep enough on pricing strategy and execution to drive significant results.